I have been a user of Go Henry for a few years now, when I say me, I mean mainly my kids have used the service. The concept of the product is quite straight forward. You register on their website, they send you a debit card in the post, you load money onto the card via the app or website and your child uses the card to buy the things they need. Go Henry Card ticks so many boxes and there is a very good reason they are the market leader. It has all the features you could want and it's been essential in helping us educate our kids. Pocket money has come a long way since I used to count the coppers each Saturday when I went to my Grandmas house. As I have been using the service for a number of years I thought I would create a simple website, to help share my experiences. Hopefully you enjoy my Go Henry Review but of you feel like I have missed something out, then please feel free to comment below and I will add it into the review. It’s an amazing tool that has helped us to educate our children about money, and how to be responsible with it. So much so that we thought we would put together a blog to help other parents and to share our experiences. It’s a smartphone app, website and contactlass VISA debit card, that helps parents teach their children and teenagers how to manage their finances. The cheque is now virtually unused and buying things with cash is on the decline. I wonder if our children will be the first generation to use electronic money systems, more than cash? The difficulty is that spending on plastic and microchips can easily lead to unmanageable amounts of debt. This is where the debit card has really helped us as a family and why I wanted to write several Go Henry Reviews, as I believe they are helping to provide financial education to our children, in a fun and practical way. As a parent of two children aged 10 and 12, I feel I have a responsibility to prepare them to manage their finances. GoHenry has a website with full reporting and a simple to use interface for setting up the parameters for each child. I can easily set up controls and allowances and they can only spend what I permit them to spend. They can also earn extra pocket money, I simply add it to their account using my smartphone, at the click of a button. If your child or teenager has a smartphone, tablet or iPod, then they can also access the smartphone app. The app contains a list of tasks or household jobs that they can perform to earn extra money. The app also shows them instantly where they have spent their money and what they have left to spend. The great thing is that it’s free for two months. If you sign up through our website. Then it’s just £2.99 per month thereafter. There are no other charges for using the card within the UK, free to transfer fund via the bank. To top up the card via a debit card incurs a 50p charge but the funds are available instantly. Nobody likes signing up to something and then finding out there are hidden costs and fees. After all we are dealing with a product here for handling your child or teenagers money. Other than the charges listed above everything else is covered in the monthly fee that they charge. There is no overdraft facility with the card and therefore no overdraft fees. 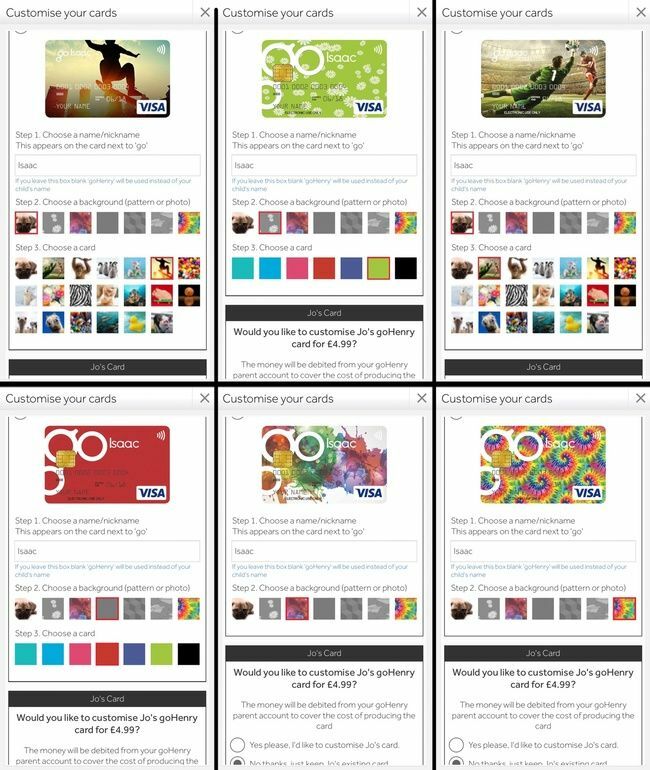 We have tested the cards and when you make a purchase your child or teenagers account instantly updates. You can be confident that when your child or teenager uses the card, they cannot spend use it elsewhere if there are insufficient funds in their account. All the charges below are fully published on their website so whilst they are not hidden, they can lead to additional charges over and above the £2.49 per month. There are other pocket money apps that do a similar job, so it’s only fair when creating this site and writing all the reviews that I also take a look at other similar products. I have found it to be the most feature rich, but there are cheaper alternatives if you don’t require all of the features. 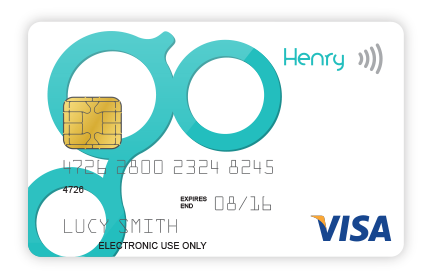 The Go Henry App is probably the easiest way to manage your account and what your child can and can’t use the card for. From the app you can set savings goals for your child and see the balance on the account. 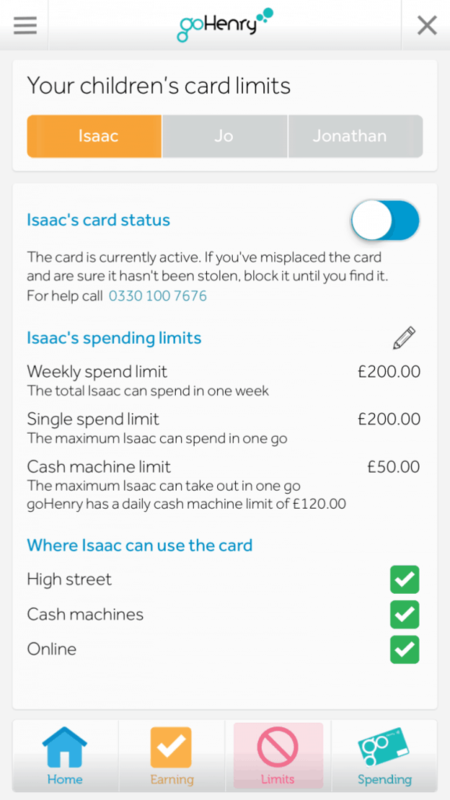 The card can also be blocked within the app as well as whether or not the card can be used online, at a cash machine or in shops. The makers of the product also sends you an alert whenever your child or teenager makes an in-store purchase or withdraws money from a cash machine. If they lose their bank card, then at the click of a button the card can be blocked, either by you or your child/teen. I am an Apple iPhone user but if you are on Android like the Samsung phone then you can get the app from the Google play store and it has all the same features as the Apple iOS version. I can’t really offer an opinion as to what the Google Play version is like as I have never used the app. If someone has used the Google Play version and they would like to write a review for me I am more than happy to publish it on the site. A grandparent can get a card on behalf of a grandchild. It’s not necessary to be the legal guardian of a child. So long as the person who is applying for the card is over 18 years of age. They have also introduced a relative feature where a parent can send another relative a unique link. As a security measure the link is only valid for a set period of time and then it expires. The good thing about the blocking feature is that if your child is anything like mine they are forever misplacing things. The block can be put in place temporarily via the app and then if the card is genuinely lost, it can be reported and a replacement card sent out. If the card is genuinely lost then you can call the Lost Card telephone number and get a replacement card sent out. To order a replacement card the ​number is 0330 100 7676, there is a fee for a replacement card which is £3.99. The same is true if the card is damaged. Before making my decision to sign up with the card I read numerous reviews but at the time struggled to find one that went in to enough detail. This was the main reason for building this website as I wanted to make sure that I shared the benefits of using the card as a parent. There are numerous reviews out there now so it’s less of an issue. Time flies by and when I first started to use the card my eldest son Isaac was 10. Now he is 13 and in the second year of high school. We load his card with his bus fare and lunch money. He can decide to ride his bike to school instead and take sandwiches and therefore keep the money. Hopefully this is helping to teach him to be responsible with his money, if there are ways you can save, then it’s a good thing. An addition that they added quite recently was the ability to customise the card. The original card design was a little boring, so the fact that the card can now be customised adds a little bit of personality. There are animal designs to choose from, this include a pug, kitten, monkey, hamster, horse, emu to name just a few. Should your child be more sports orientated they can choose a basketball or football design. There are also funky patterns if your child has a creative personality or just the ability to have a plain card in there favourite colour. It’s a welcomed addition and nice to see the company making their product more appealing. How does it work you may ask, quite easily. There is a smartphone app, a website, parental controls and a contactless debit card. You simple load funds in to you child’s app and they are free to use the card however they want, so long as how it works complies with the parental rules that you put in place. Is It A Bank Account? When you start a blog about a subject you tend to get asked a few questions about the product. I am more that happy to help where I can so please feel free to email me. I have been asked several times is it a bank account? Although not technically a bank account, it is pretty much like a bank account because it offers all the same functionality and when it comes to children’s banking, they actually offer more. Which is why when you do a search for goHenry bank account reviews you will see lots of comparisons between the two. One thing that is worth mentioning though is that your money deposited isn’t covered by the FSA Compensation Scheme. This is a government backed scheme whereby up to £85,000 of your money is covered should something happen to the bank or building society. As the makers of the product aren’t a bank they deposit all your money into a NatWest account. This is covered by the FSA, so should NatWest go bump the money is covered. Should the creators go bump under the terms of being a VISA operator, it means that your money is protected by NatWest bank and they would return the funds. So from a security point of view it’s as secure as any other financial product on the market. There are other options that we have tried out and tested which we have also included in the blog. Hopefully or Go Henry or Osper blog post will be of some use to you. To summarise Osper always seems to be catching up to but they are gaining ground quickly and it’s a reasonable alternative. In addition to the monthly fee there are a number of additional charge for using the account. I have summarised these in to a table for you. They are very similar to the charges that your bank would issue. Overall I don’t think that the additional charges are unreasonable and are mainly there because of the fees banks charge for international transactions. The only fee that will effect you if you are based in the UK is the Debit Card loading fee which is currently 50p. This can easily be avoided by topping up your account by bank transfer. If you think that the prices that Go Henry charge then we have listed some other options for you to take a look at. These are as follows, Osper, Pockit and Nimbl. If you sign up via our website we have an amazing offer of two months for free. If you sign up via their website they offer you a month for free, so it’s worth getting the additional month for free as this will give you the chance to try it out properly before deciding whether or not it’s for you. It doesn’t cost anything to get started and you can always cancel should you decide it isn’t for you. It has a parent account login for the app. This enables you as the parent to login and configure the different options. As a parent you can set the spending limits on each child’s account and configure where the card can be used. 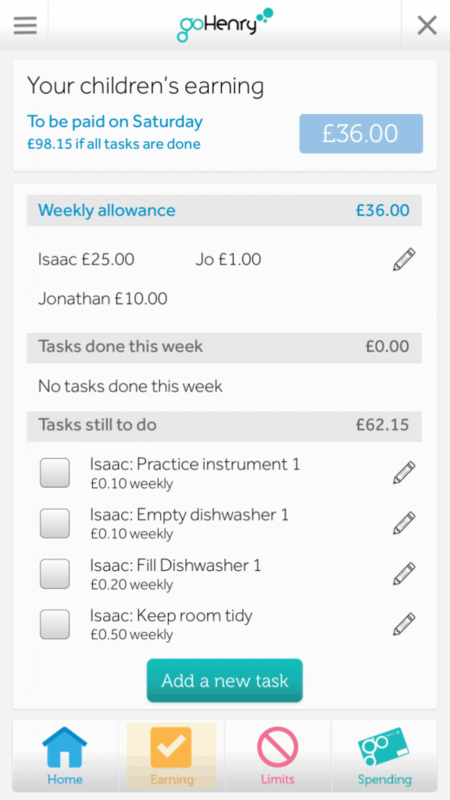 As the parent you can also create daily tasks that your child can complete to earn more pocket money. There are cheaper alternative products on the market if you’d like to read more about these then take a look at Osper, Pockit or Nimbl. The biggest thing I have discovered when taking a look at the competing products, is that they either lack the features of Go Henry or they contain charges for things like withdrawing money from a cash machine. These hidden charges aren’t ideal really and could lead to your child losing a large proportion of their spending money in fees. For this reason I give Go Henry a 5 star marking and give it a thumbs up. You can trial it for 2 months for free, this gives you the opportunity to explore the product and see if it’s the right fit for your family. DISCLAIMER – THIS IS AN INDEPENDENT WEBSITE WITH NO OFFICIAL CONNECTION WITH THE CREATORS OF THE APP.